Guess what day it is? Guess what day it is? It's hump day!! Woot Woot! *Insert GEICO commercial featuring the camel, lol! * I got this adorable camel sweater for Christmas and if you watched my Christmas Haul you also saw it featured there. I was so excited to wear this sweater! It is one of my favorite colors, coral and it has a camel on it, it can't get much better than that! I am DYING over this sweater! I love it so much! 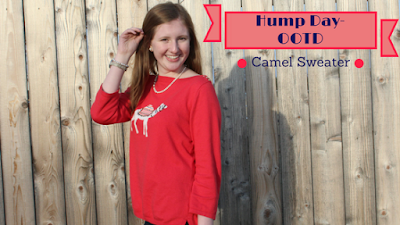 The coral color is so fun and the camel has fun details like beads and embroidery. I don't have a good picture of them but the shoulders each have three gold buttons sewn on (that can not be unbuttoned). It may not look like it in the pictures but I was FREEZING!! It has been so cold so I paired the adorable sweater with my duck boots and a pair of cream colored socks. My jeans are Old Navy Rockstar jeans which I love! For jewelry I wore my favorite set of pearls and my new Kate Spade watch.